Amazon introduced a convenient way for teens 13 through 17 years old to shop on Amazon with their own login. For the first time, teens can independently use the Amazon App, allowing them to shop or stream content while still keeping their parents informed. 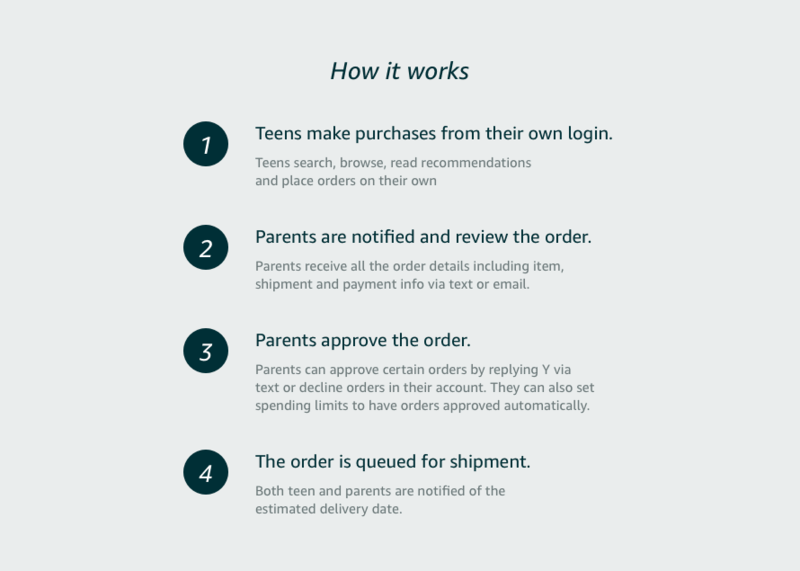 Parents can approve all orders or set pre-approved spending limits per order – offering teens a customized level of autonomy that can change and grow as they do. Teens and parents can learn more and sign-up at amazon.com/forteens. As someone who has a 12-year-old, I already know this will be helpful moving forward. My children get money from their grandparents on every holiday. Seriously… $10 for Memorial Day? WHY?! I don’t know why but it happens. And I think this is a really smart way for parents to allow their children to have a sense of independence while still controlling the final say on all household purchases. When a teen finds something they wish to order, they can place the order on the Amazon App, and parents will receive a text or email showing the item, cost, shipping address and payment information. The teen can also include a personalized note like, “this is the book I need for class.” The parent can approve the order by text or they can visit their orders page to review it in more detail. By default, parents approve every order. Be sure to check out amazon.com/forteens for more information.